Enjoy: 'That's OK, I'll pay for her' ~ if you smile, your friends will, too! The Norwegian newspaper VG has reported a truly amazing story about a newly-wed trying to get to Norway to be with her husband, and the stranger who helped pay an unexpected luggage surcharge. The Oct 05, 2008 blog 'Leisha's Random Thoughts' has translated the story. Mary Menth Andersen was 31 years old at the time and had just married Norwegian Dag Andersen. She was looking forward to starting a new life in �sg�rdstrand in Vestfold with him. But first she had to get all of her belongings across to Norway. The date was November 2nd, 1988. Mary Andersen was at the Miami airport checking in for a long flight to Norway to be with her husband when the airline representative informed her that she wouldn't be able to check her luggage without paying a 100 dollars surcharge: when it was finally Mary's turn, she got the message that would crush her bubbling feeling of happiness. "You'll have to pay a 103 dollar surcharge if you want to bring both those suitcases to Norway", the man behind the counter said. Mary had no money. Her new husband had traveled ahead of her to Norway, and she had no one else to call. As tears streamed down her face, she heard a 'gentle and friendly voice' behind her saying, "That's okay, I'll pay for her." "He had a gentle and kind voice that was still firm and decisive. The first thing I thought was, who is this man?" Twenty years later, she is thrilled that the friendly stranger at the airport may be the next President and has voted for him already and donated 100 dollars to his campaig! "He was my knight in shining armor," says Mary, smiling. 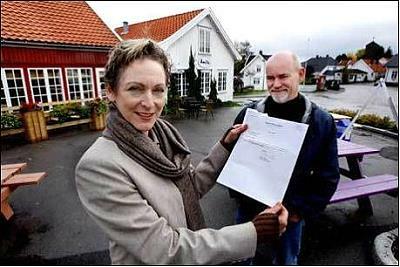 She paid the 103 dollars back to Obama the day after she arrived in Norway. At that time he had just finished his job as a poorly paid community worker in Chicago, and had started his law studies at the prestigious Harvard University. Mary even convinced her parents to vote for him! 'I want to thank you for the lovely things you wrote about me and for reminding me of what happened at Miami airport. I'm happy I could help back then, and I'm delighted to hear that your daughter is happy in Norway. Please send her my best wishes. Truly a wonderful story and something that needs to be passed along in the maelstrom of fear-and-smear politics we are being subjected to right now. Remember this was 1988, when 100 dollars was quite a bit of money, in comparison to its value today.